No matter what kind of project we take on, we always infuse our designs and installations with our ethos of sustainability. From materials and plant selection, to irrigation design, to long-term maintenance planning, our team is committed to making sure that our projects are as green on the inside as they look on the outside. 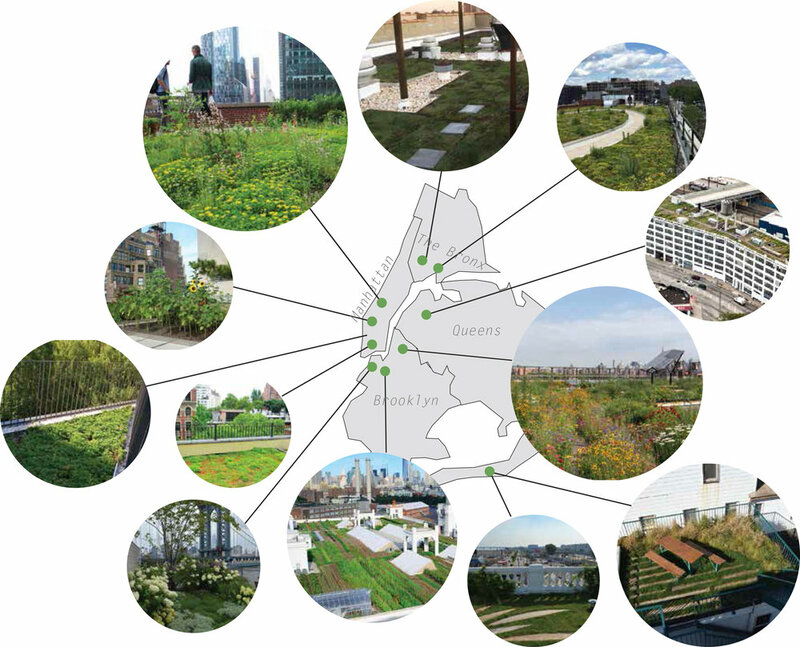 Since we began offering landscaping services to New Yorkers in 2012, our Design/Build team at Brooklyn Grange has installed over 40,000 square feet of green roof area to the City, in addition to our 135,000 square feet of cultivated area on our own farms. We have also installed and activated dozens of other spaces, including terraces, back yards, tree pits and vacant lots with soil and plants. Adding and improving green space in New York improves the city's air, water, temperature, biodiversity, and overall well-being, and it is one of the most rewarding ways that we work to achieve our mission of making cities greener and move livable. Wherever possible, our installations utilize green materials such as reclaimed and/or sustainably-harvested lumber, post-industrial recycled green roofing materials, and durable, inert metals that are designed to last for generations. We don't use chemically-treated wood products, and we work with certified organic soils and natural, untreated mulch and other materials. Our plants are sourced from nurseries throughout the East Coast, and although much of the available nursery stock is not organically-grown in this region, we always use organic practices to maintain them once the plants come into our care. We maintain all of our farms and gardens in accordance with organic principles, using only organic-approved soil amendments. You will never find chemical fertilizers or pesticides on our projects sites, and we are committed to adhering to sustainable farming and garden practices, and avoiding toxic implements at all costs. Many of our installation sites include on-site composting, and for those that don't, we remove all organic waste and bring it to local composting facilities for recycling. We are also committed to re-using materials, and our team will save and re-use everything from garbage bags to wood scraps to every extent possible. We even go as far as saving damaged or discarded plants, bringing them back to our farms to nurse them back to care and integrate them into our ornamental plant areas. Almost all of our installations employ water-efficient drip irrigation systems, which include rain sensors and timers to ensure that water isn't being wasted. What's more, our rooftop installations are responsible for retaining tens of thousands of gallons of rainfall every time it rains in New York, which keeps stormwater out of our sewer system and helps to combat New York's Combined Sewer Overflow problem.